As a homeowner, you strive to keep your home and everything in it working as safely and as efficiently as possible. Those of us at Copper Top know that leaves you with a lot to think about and consider, which is why we strive to provide thorough, accurate, and stress-free chimney and fireplace evaluations and services as well as effective, professional repairs. We know that when we detect problems early on, stop problems in their tracks, and provide our customers with preventive services, we’re helping them save money and enjoy a safer, more enjoyable home life. And it all starts with an annual inspection. Annual inspections are recommended by the National Fire Protection Association (NFPA) and the Chimney Safety Institute of America (CSIA) and oftentimes reveal problems in their infancy – which is great, considering how expensive repairs can be once extensive damage is done. Whatever your inspection reveals, you can count on us to provide expert repairs, expert advice, and expert recommendations for preventing problems in the future. Chimney Leaks – A leaky chimney can cause all sorts of damage, from a rusted firebox and liner to crumbling masonry and rotting framing. If you’ve started seeing signs of water damage or you think you may have a chimney leak, we can help. We’ll put a stop to your leak and make any needed repairs to prevent future problems. Chimney Relining – A damaged chimney liner can quickly lead to smoke problems, masonry damage, extensive safety and efficiency issues, and even house fire. Whether your existing chimney liner is terra cotta or metal, or your chimney lacks a liner altogether, our technicians can reline your system with a high-quality stainless steel liner that will last and last, regardless of your fuel type. 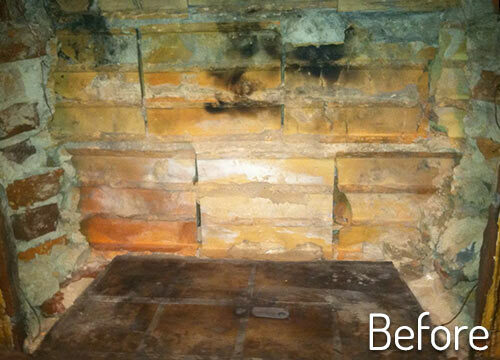 Smoke Chamber Repair –Because of its location (quite literally in the line of fire), cracks, holes, and spalling brick commonly develop along the smoke chamber, leaving areas of resistance and spaces for gas, smoke, and high heat to access nearby combustibles and the air supply of the home. If your smoke chamber is contributing to your safety and efficiency issues, you can count on us to parge it smooth and leave you with a sealed smoke chamber surface that encourages smoke and heat to swiftly exit the flue. Masonry Tuckpointing – Masonry is strong and long-lasting, but that doesn’t mean it’s impervious to damage. In fact, mortar oftentimes develops cracks, holes, and recedes, compromising the beauty and strength of the entire chimney and fireplace. 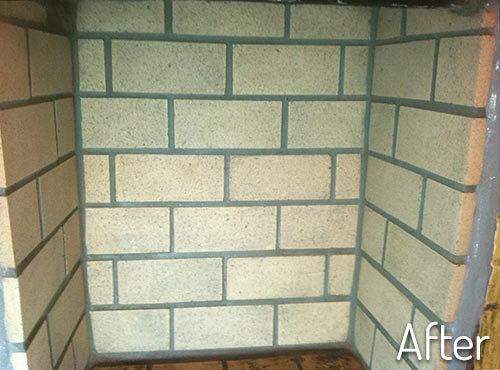 If your masonry is starting to look worse, we can restore it with professional masonry tuckpointing services. Masonry Chimney Rebuild/Restoration – Whether your chimney is old or has undergone damage from a chimney fire or a strong storm, when you need your chimney rebuilt or restored, you can count on Copper Top. We specialize in masonry rebuilds, tuckpointing, and brick replacement, and will leave you with a beautiful and durable chimney – guaranteed. Those of us here at Copper Top are committed to making the lives of our neighbors in Atlanta, Augusta, Chattanooga, Ringgold, and everywhere in between more enjoyable by providing comprehensive chimney care and repairs. Whatever you need, let us know! Call 770-944-1200 today or request an appointment with one of our licensed and insured professionals online. In addition to all our chimney and fireplace skills, Copper Top also provides complete dryer vent cleaning services to make sure this important vent system is free of lint build-up and other debris.